Removal ProcedureRemove the left bank secondary timing chain. Refer toSecondary Camshaft Intermediate Drive Chain Replacement - Left Side.Remove the fuel pump. Refer toFuel Pump Replacement.Remove the Catalytic Converter. Refer toCatalytic Converter Replacement - Left Side.Remove the oil level indicator tube. Refer toOil Level Indicator Tube Replacement. 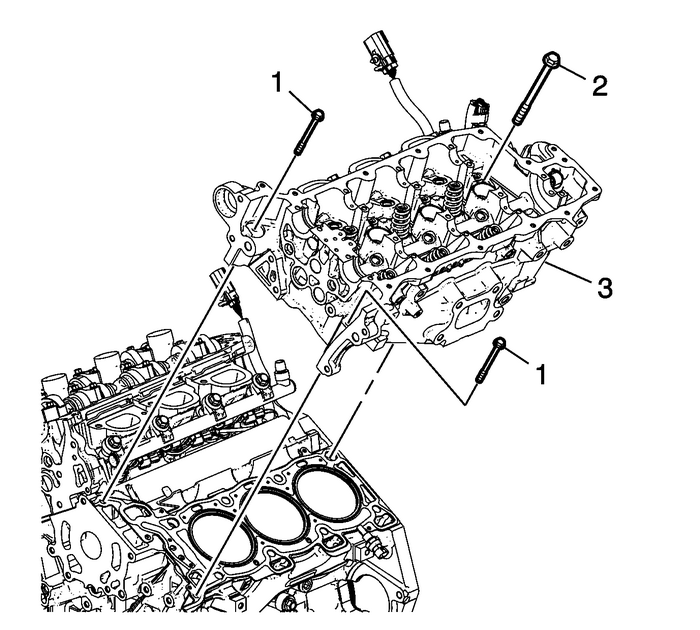 Remove the 2 front M8 left cylinder headbolts-(1).Remove the left cylinder head bolts-(2).Remove the left cylinder head-(3).Remove the ground wire bolt and ground wire.Disconnect and reposition harness as necessary. 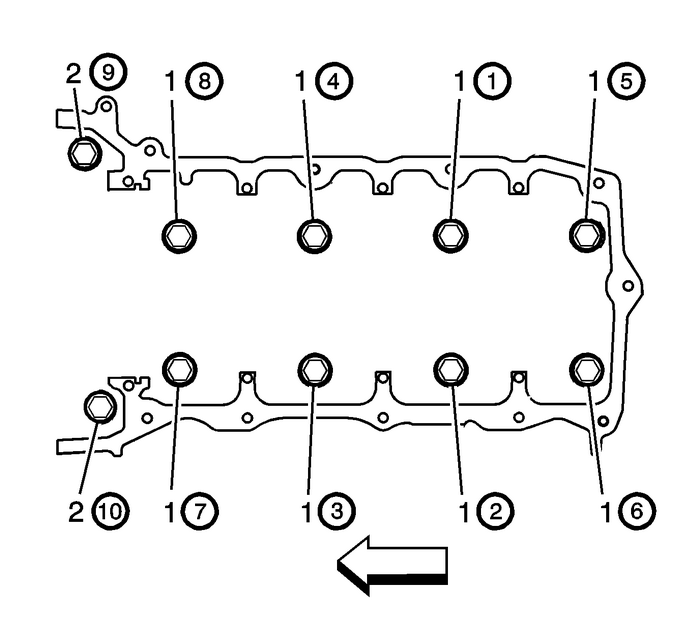 Ensure the cylinder head locating pins are securely mountedin the cylinder block deck face.Install a NEW left cylinder head gasket-(1) usingthe deck face locating pins for retention. 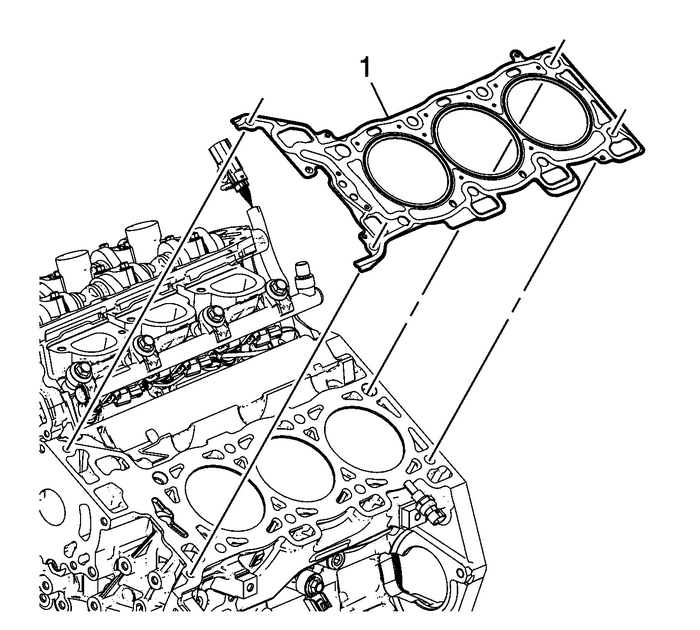 Align the left cylinder head (3) with the deck face locatingpins.Place the left cylinder head in position on the deckface. DO NOT allow oil on the cylinder head bolt bosses.DO NOT reuse the old cylinder head bolts.Install the NEW M11 cylinder headbolts-(1).Tighten the M11 cylinder head bolts a first pass in sequenceto30-Y(22-lb-ft).Tighten the M11 cylinder head bolts a second pass in sequencean additional150-degrees using theEN-45059meter.Install the 2 NEW front M8 left cylinder head bolts(2).Tighten the M8 cylinder head bolts a first pass to15-Y(11-lb-ft).Tighten the M8 cylinder head bolts a second pass in sequencean additional75-degrees using theEN-45059meter.Install the left bank secondary timing chain. Refer toSecondary Camshaft Intermediate Drive Chain Replacement - Left Side.Install the camshaft cover. Refer toCamshaft Cover Replacement - Left Side.Install the fuel pump. Refer toFuel Pump Replacement.Install the generator. Refer toGenerator Replacement.Install the exhaust manifold. Refer toCatalytic Converter Replacement - Left Side.Install the oil level indicator tube. Refer toOil Level Indicator Tube Replacement.